Fruit loaves are a fabulous tea time treat and are wonderful examples of just how simple sugar free cooking can be. Easy to bake and delicious when sweetened naturally, they are filling, full of goodness and ideal when sliced and wrapped for lunch boxes. In all of the following recipes, the fruit content itself is used to sweeten the loaf or bread. Containing high levels of natural sugar, dried fruit can be an ideal sweetener in sugar free cakes. In other cases, however, fresh fruit can work just as well. It is vital, however, to ensure pieces are ripe or even over-ripe. Moist, spicy and with a flavour all of its own, banana bread is a true energy food. Also high in antioxidants and vitamins, it has all sorts of nutritional benefits. This sugar free version calls for soft, very ripe - even black - bananas, and is therefore also a great way of using up old fruit from the bowl, which would otherwise be thrown away. Preheat your oven to 170 deg C (350 deg F/gas mark 4). Place all your dry ingredients into a large bowl and mix. Beat your eggs in a separate bowl then slowly mash and stir your soft bananas into the liquid. Spoonful by spoonful, gently fold the banana and egg mixture into the dry ingredients, to make a batter. Pour into a greased loaf tin (23cm x 13cm x 7cm) and bake for approximately one hour. When ready it will be golden on top, springy to the touch and an inserted skewer or sharp knife should come out clean. Leave to cool and slice. 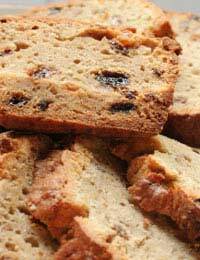 This is a rich, fruity loaf that is a perfect sugar free cake alternative. The trick to its success is to ensure your dates soften well, releasing their natural sugars into the water and that the loaf is not over cooked and therefore remains moist. Preheat your oven to 170 deg C (350 deg F/gas mark 4). Gently soften your dates in the water in a small saucepan on a low heat (this is important if you want a truly sweet sugar free loaf). Set aside to cool. In a separate bowl beat your butter until creamy, then add the eggs and mix. Stir in your walnuts, flour and all spice. Add your softened dates and water, plus a splash of milk. Spoon into a greased loaf tin (23cm x 13cm x 7cm) and bake for about 40 minutes. When ready the loaf should springy to the touch on the surface. Leave to cool and slice. This sugar free loaf is less of a cake and more of a bread. It makes a perfect snack at any time of day and is delicious when toasted and buttered, or when spread with sugar free jam. Preheat your oven to 180 deg C (375 deg F/gas mark 4). Gently soften your sultanas in the water in a small saucepan over a low heat. Simmer for about three minutes. Rub your butter into the flour, add bicarbonate of soda, salt and cinnamon. Stir in your sultanas and water. Mix and pour into a greased loaf tin (23cm x 13cm x 7cm). Bake for about one hour. Wait until cool before slicing.